The landscape all around is a spectacular mix of salt water lakes, sea, mountains, islands, lagoons, flora and fauna and vineyards covering 12,000 hectares of protected natural park. This provides a unique landscape and offers a wealth of outdoor activities for holidaymakers. You can walk around parts of the 75km Gulf Path, cycle along the numerous cycle paths, swim, sail, kayak, windsurf, kite surf, fish, row to the islands, spot flamingoes, herons, cormorants, storks, visit local vineyards for a wine tasting or just sit on the terrace and enjoy the views and the peace. It is the perfect place to stop, switch off, relax and reconnect. The village itself sits in a protected rocky outcrop with spectacular views over the water; an utterly peaceful oasis of calm. In the village, everything you need is close at hand; there are two restaurants plus a third restaurant/café/epicierie/ with organic fruit and vegetables, fresh bread and general supplies. Thanks to its picturesque setting and charm, the village also attracts artists and there are a couple of lovely art galleries. A cycle ride away in Peyriac de Mer (6km) are more restaurants, a small supermarket, chemist and a choice of viticultures with wine tasting. The cycle tracks are spectacular and a great way to see the numerous birds on and around the lagoon. Across from Peyriac is the hidden beach of Doul and swimming here in the little Etang de Doul near Peyriac is an interesting experience as the water is 43% salt, similar to the Dead Sea. In Bages itself, you can rent out kayaks, dinghys or windsurfers at La Bateautheque and explore the lagoons or cycle around the water to the sailing club La Nautique where there are bigger boats, sailing and windsurfing lessons and another good restaurant. For something entirely different, just 15km to the south of Bages is the Sigean African Safari park with over 3,500 different animals and a great day out. Slightly further afield, there have been salt farms in Languedoc Roussillon since Roman times and the Saint Martin’s Island Salt Marshes near Gruissan are part of a protected environment where this trade continues. Here you can take a guided walk across the marshes, including a commentary on the birds and salt-loving flora, to see production techniques on the salt pans. Location is everything and Bages has so much on its doorstep; national park, historic towns, glorious vineyards and immense stretches of sandy beaches. It also has eight major airports within easy reach (see details below) including one within half an hour and the motorway for every direction is just a 15?minute drive. The south’s most attractive cities are all within easy reach: Narbonne is just 15 minutes/10km, Carcassone 30 minutes, Perpignan 30 minutes, Montpellier under an hour, Beziers 25 minutes and Barcelona two and a half hours. In addition, Bages is 20?25 km from all the famous golden beaches of the Languedoc; Narbonne-Plage, Gruissan and La Franqui and just an hour south is Collioure for an easy day trip (take the train from Narbonne to avoid the summer traffic and parking problems) with the Spanish border just beyond. 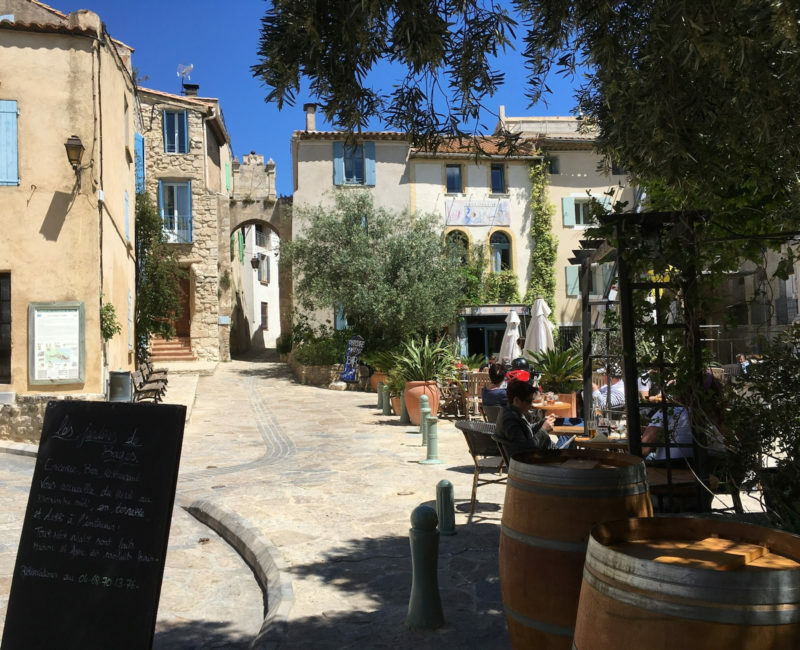 So, if you’re looking for just the right blend of relaxed French village life mixed with Mediterranean beach holiday, a smattering of history, local flavour, wonderful food and wines, a friendly welcome and easy access across the south of France, Bages is the perfect place. The closest city, Narbonne, is just 10km from Bages and is a vibrant and historic Roman city, an architectural gem. The historic centre concentrates on either side of the banks of the Canal de la Robine which links to the Canal du Midi, with a majestic pedestrianized, tree-lined avenue surrounded by quintessentially French buildings leading to the impressive cathedral of Saint-Just and the Archbishop’s Palace. All around are historic, narrow lanes of shops and cafés, bars and pretty squares of the old town. The town also has a distinctly Spanish vibe and an exceptional covered market, ‘Les Halles’ which sells fresh produce directly supplied by fishermen and local farmers. Anyone who visits Narbonne will not fail to be impressed by its sheer architectural elegance, its wonderfully cosmopolitan atmosphere, and its numerous cultural, gastronomic and historic offerings. 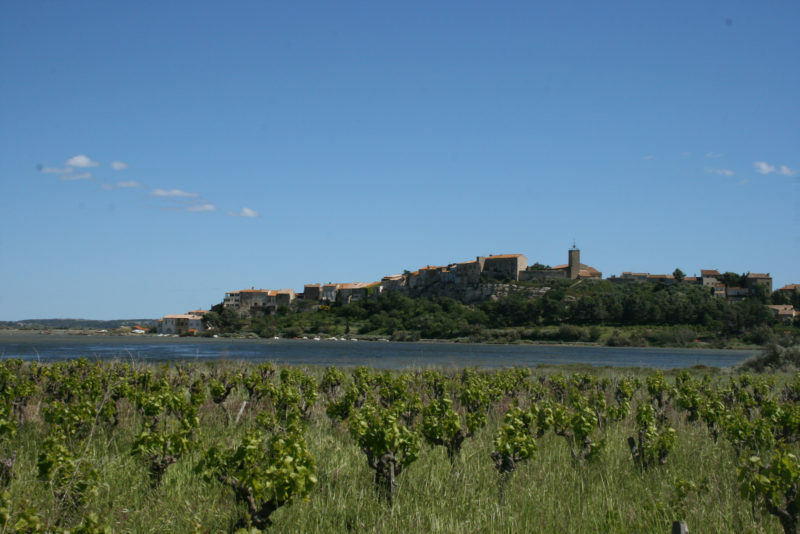 Bages is ideally located 10/15 minutes from Narbonne by car and from the main A9/N9 motorway interchange. Take the exit ‘Narbonne Sud’ on the A9 towards Barcelona and then take the N9 direction Perpignan. Following the N9 at the first roundabout, take the exit to Sigean and at the second roundabout take the exit to Bages. Follow this road through the vineyards and along the etang until you arrive in the village of Bages. Follow signs to the Mairie and our house is in the same square, with the blue shutters and attached to the historic sundial. You can drive up to the house to unload your luggage and then park for free at the bottom of the village in the car park or just along the quiet road by the lagoon. The étang of Bages-Sigean – one of the typical lagoons of the French mediterranean coast. The kingdom of birds, realm of the pink flamingos. In antiquity, the river port of Narbonne was situated close to what is today the étang de Bages-Sigean. At the time the étang was a vast gulf, open to the sea where ships from across the mediterranean weighed anchor. It was called Lacus Rubresus by the Romans because of the alluvial silt, coloured by red earth from the high valley of the Aude. The gulf was protected by the islands of St Martin, St Lucie (which now belongs to the coastal conservation area) and La Clape, today joined to the mainland. . In the 15th century the gulf transformed into the lagoon, or étang we know today, covering 5500 hectares. It is linked to the sea by the narrow inlet of Port-la-Nouvelle. After many centuries as centre of a flourishing maritime commerce, the étang is now home to professional fishing boats – the traditional flat-bottomed bétous. Pleasure craft are also welcome (the traditional catalans) and professionals in nautical sports and activities propose courses and events all year round. Boating is an excellent way to get the most out of your visit to this magnificent natural landscape which shelters an exceptional flora and fauna, at the origin of the creation of the Narbonnaise en Méditerranée regional natural park. See a recent magazine article about the area.